Forget the forget-me-nots, it’s bluegrass that’s bloomin’ this spring. In the coming weeks, we’re due for a bouquet of top-notch releases in this genre. Among them are Doyle Lawson (this week), Alecia Nugent (5/12), The Red Stick Ramblers (5/19), Dailey & Vincent (3/31), Bobby Osborne (3/31) and Rhonda Vincent (6/16). In the meantime, here’s a smattering of what’s already out there. 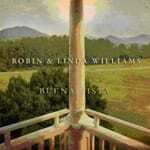 Robin & Linda Williams have been husband and wife, as well as musical partners, for more than 30 years. I find that inspiring. Even more inspiring is the on-going warmth in their sound and quality in their songwriting. Their Buena Vista is my Disc of the Day. It seems kinda funny to discover a 63-year-old guy with decades of stardom in TV, stage and movie work, but this is Steve Martin’s debut album. 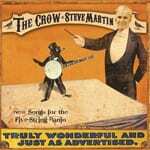 And The Crow: New Songs for the Five-String Banjo is a classy piece of business. Therefore, it earns him a DisCovery Award. —In general, I dislike live albums. I find the crowd noise distracting and the sound quality usually sub-par. Both of those factors are in play on the Grammy nominated CD Earl Scruggs with Family & Friends, which was recorded at a Ryman concert in 2007. Having said that, the picking on this group of 18 tunes surveying the living legend’s career is jaw dropping in quality. Many familiar standards are here—“Salty Dog Blues,” “Earl’s Breakdown,” “In the Pines,” “You Ain’t Goin’ Nowhere,” “Soldier’s Joy,” “You Are My Flower,” “The Ballad of Jed Clampett” etc. Start with this classic, then mix and match with anything else and be dazzled. —Some of you might recall Ulisse as an Atlantic Records country stylist of the 1990s. Her transition to bluegrass has been a smooth one. The title tune to her latest is a gospel-infused toe tapper featuring some cool dobro work by Rob Ickes. Also check out the tragic story song “Levi Stone.” Producer Sewell has rounded up a stellar cast here—in addition to Ickes, it includes Andy Leftwich, Scott Vestal, Curtis Wright and Claire Lynch. —Echoes of the Mountains is the latest from this long-enduring ensemble. Founded by Ron Thomason in 1976, Dry Branch Fire Squad has retained its soulful, rustic qualities throughout its existence. The group goes for feeling rather than virtuosity, which has led some to dub it “the missing link between old-time and bluegrass music.” On this haunting track you’ll be tempted to come down on the “old time” side of the equation. But on the scampering “Grayson’s Train,” you’ll probably want to switch that opinion. Adding to the conundrum is a repertoire here that stretches from 1985’s “Seven Spanish Angels” to 1927’s “Rovin’ Gambler,” not to mention “When You See Those Flying Saucers” (The Buchanan Brothers, 1947). —These Prairie Home Companion favorites came to Nashville’s Tim O’Brien for their latest, their first new CD in four years. The title tune is a cheatin’ drunkard’s number with terrifically lilting harmonies and a rolling groove that is positively seductive. I have always loved this couple. I swear they’ve never made a bad album in their lives. It’s not “bluegrass” in the strictest sense. It’s just gooooooood.